Category Archives for "St. Andrews Villas Homes For Sale"
Located on a premium lot with a beautiful view, this home is one of the first homes that the developer will build in the community! You can still select the interior finishes you want for this home! St. Andrews Park Villas is a beautiful community of new homes for sale in Port St. Lucie FL! Built by Tiffany Homes, St. Andrews Park brings you brand new under construction custom villas boasting over 2,000 sq.ft. The floor plan of this home is called “Biltmore” and it features 2 bedrooms, 2 bathrooms, plus a den. This home will back up to a beautiful and relaxing canal view. See the photos below for inspiration on designing the interiors of your dream St. Andrews Park villa! For upgrades, additional charges may apply. Each villa in St. Andrews Park has lovely exteriors from beautifully manicured lots, brick pavers on the driveway and entry walk, and designer coach lights. You’ll also notice other distinctive exterior appointments such as the concrete tile roof and the two car garage with electric door openers. Disclaimer: The images below are of the model home “Biltmore” and are used for illustration purposes only. Upon entering this St. Andrews Park villa, you’ll truly feel like you’re home. The great room and the kitchen has an expansive and spacious floor plan and the high ceilings give the room a bright and airy feel. Aside from the fact that it’s spacious, this is also an energy-efficient home featuring R-30 fiberglass ceiling insulation, impact resistant glass windows and doors, as well as Carrier ® heat pump heating and cooling system with minimum 16 SEER rating saving you roughly $2,000 on heating and cooling costs from usage of the system through it’s lifespan. A unique feature to this model is the den. As you can see below, the ceramic tile floor has a wood design giving the room a more elegant and chic appeal. You can design your space according to your liking.Find out more about the home customization options by viewing our St. Andrews Park Villas floor plans page. This beautiful kitchen of this home has a breakfast bar, granite counter tops with decorated edge, and a 4″ backsplash. Recessed panel birch cabinets offer plenty of storage for all your cooking essentials. The kitchen also comes with high quality General Electric ® kitchen appliances including a refrigerator with built-in ice maker, a smooth surface range, a built-in microwave, and a multi-cycle microwave. You can even choose the colors of the appliances from St. Andrews Park’s selection based on your design theme. You can upgrade your appliances and counter top materials, too. This St. Andrews Park villa for sale has a charming little breakfast nook next to the sliding glass windows which allows natural light to flow into the space giving your day a bright and beautiful start. The designated laundry area of this one-story villa is just a few steps from the kitchen and is close to all rooms in the home which makes doing everyday chores a breeze. The master bedroom of the home is the perfect place to relax after having a fun day socializing with friends at the clubhouse or at the country club. This room has a spacious walk-in closet to store all your daily clothing essentials, your beach wear, and even your golf apparel. The master bathroom has a roman-style tub for those days when you want to relax and have a nice warm bubble bath. It also has classic bathroom appointments such as a double vanity with granite countertop, designer vanity lights, chrome Moen ® faucets, ceramic bath accessories, and a separate shower area with clear glass enclosure in chrome. The second bathroom which features a tub and shower combo as seen below also features the same classic appointments for the vanity area. St Andrews Park Villas in Port St Lucie FL allows you to enjoy a maintenance-free lifestyle! The low monthly HOA fees already cover basic homeowner’s insurance, community landscaping and irrigation, basic cable TV, internet access, street lighting, individual home lawn maintenance, maintenance of the homes’ exteriors, roof and exterior walls’ insurance, as well as full-access to the community clubhouse. St. Andrews Park Villas’ 6,000 sq ft clubhouse boasts of a tropical swimming pool, a complete fitness center, a media room, a card and game room, as well as a gathering room with a partial kitchen perfect for gatherings. Fitness buffs will love the fitness center! It has just about everything you need for a great workout including treadmills, pulley machines, elliptical, stationary bikes, tread climber, and dumbbells. Homes for sale in St Andrews Park Villas are a few steps away from The Champion Turf Club at St. James located across the community. For interested golf enthusiasts, they offer both seasonal and annual memberships. St. Andrews Park Villas is also approximately 15 minutes away from the best beaches and deep sea fishing spots in the country! You can also visit many beautiful nature preserves nearby including the Oxbow EcoCenter’s 225 acre preserve. Do you love shopping but hate the hassle of driving to the mall? Well, fret not because the Publix shopping center is within walking distance from the community! Located in the heart of Port St. Lucie Fl just across The Champion Turf Club at St. James, St. Andrews Park Villas bring you a total of 70 energy-efficient homes with chic interiors priced in the low $200,000s. This is the Durham model, a single-story 3 bedroom 2 bathroom home with a 2 car garage and a covered porch. Brick paves the driveway and the front porch of this lovely home. Entering the home, you’ll see that the foyer has elegant 18’x18′ ceramic tile flooring similar as the kitchen. Disclaimer: Disclaimer: The model of this villa is “Durham”. The images here are of the model “Chelsea” and are used for illustration purposes only. Natural light just flows into the living room of this home. Looking around the space, you’ll appreciate the high ceilings and in terms of design, it’s chic knock-down texture. This living area of this home also has R-30 fiberglass ceiling insulation to keep the home cool during warm months. All windows and sliding glass doors are made of impact resistant glass. It’s a great space for entertaining neighbors and friends. Moving on to the kitchen, it has granite countertops with a decorative edge and 4” backsplash. The kitchen appliances of this home includes: a General Electric ® 25 cu. Ft. side-by-side refrigerator with built-in ice maker, a General Electric ® smooth surface range, a Built-in General Electric ®microwave, and a Multi-cycle General Electric ® dishwasher, all in your choice of colors. You can also select the color of the cabinets. Do you want an upgraded gourmet kitchen? Check out St. Andrews Park floor plans for information on customization options! This St. Andrews Villa home also has a designated laundry area. Since it’s just steps away from the kitchen and all the other areas of the house, doing the laundry is definitely going to be convenient. No more going up and down a flight of stairs! The dining room of this home is truly marvelous. Just look at the beautiful tray ceiling design. Depending on your taste, you can hang a rustic lighting fixture like you see below or perhaps a nice chandelier. This space sets the perfect mood for a beautiful evening with your loved one as well as friends. The master bedroom is your very own personal sanctuary. After a fun day of enjoying the community’s luxury amenities, this is definitely the best place to relax. Tray ceilings adorn this room. There’s also a walk-in closet for your resort wear for when you lounge by the St. Andrews Park swimming pool, your clothes for golfing, and of course your sun hat and visor. Before making yourself some popcorn and enjoying a fun movie night, why not pour yourself a glass of wine and have a relaxing bubble bath in your master bathroom? Take a look. You’ll love that your double vanity also has designer lights. You also have separate shower area with a clear glass enclosure in chrome. Guests staying the night will also have their own beautiful space to relax after a fun day. St. Andrews Park is the perfect place to enjoy a luxurious and maintenance-free lifestyle. The low HOA fees in St. Andrews Park Villas cover individual home lawn maintenance, maintenance of the homes’ exteriors, roof and exterior walls’ insurance, homeowner’s insurance, community landscaping and irrigation. It also includes basic cable TV, internet access, street lighting and full-access to the St. Andrews Park Community Amenities. The St. Andrews Park community clubhouse features a large swimming pool, a media room with a partial kitchen for gatherings, a game room perfect for poker night, and a complete fitness center. 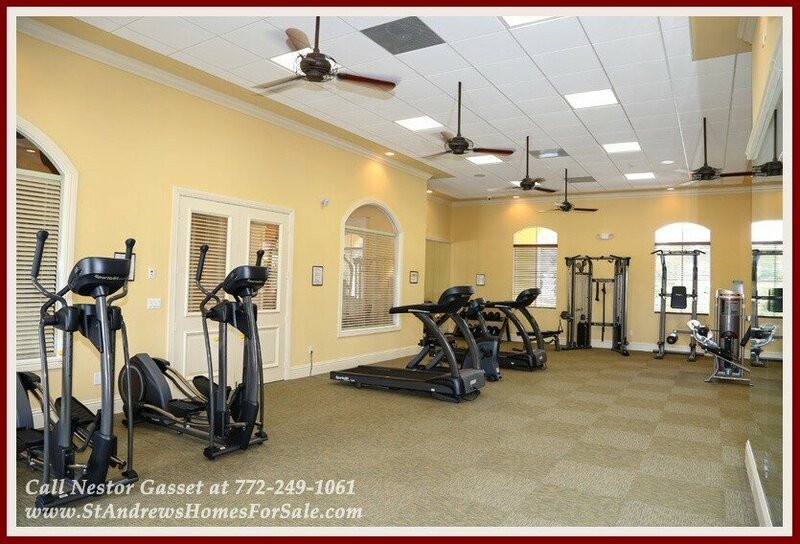 Health and wellness enthusiasts will love the St. Andrews Park fitness center. You can choose from a wide variety of exercise equipment including the elliptical, treadmills, tread climber, stationary bikes, pulley machines, or dumbbells. For those who love swimming, head on over to the St. Andrews Park luxury swimming pool and heated spa. Lounge around under the sun, and don’t forget your sunblock! You can also relax at the covered patio and sun deck while socializing with neighbors and friends. St. Andrews Villa in Port St. Lucie FL boasts of 70 one-story villas with beautiful water views and lush preserve views. Close to unspoiled beaches, acres of nature preserves, and first-class golf courses like St. James Golf Club, this is the perfect location to start living your dream life. You can choose from available lots in St. Andrews Park to build your dream home on! This is one of the first villas that the developer will build in St. Andrews Park Villas! You can still select the interior finishes that you prefer! Picture your dream home. Does it include elegant interiors? Is it energy-efficient? Is it nestled in an expansive community located at the heart of Florida’s treasure coast? St. Andrews Park’s Villas and homes for sale in Port St. Lucie FL might just be the perfect fit for you – minus the hefty price tag. Disclaimer: The model of this villa is “Durham”. The images below are of the model “Chelsea” and are used for illustration purposes only. Introducing the St. Andrews Park Villas’ Durham model, a 3 bedroom 2 bath energy-efficient home located in the vibrant city of Port St. Lucie FL. This home boasts of high ceilings and crown molding throughout, with R-30 fiberglass ceiling insulation that helps keep your home cool especially during the summer time. Would you prefer a 2 bedroom home instead? Check out this 2 bedroom St. Andrews Park Villas home. One of the first things people will notice when they enter the house is your entryway. Hang family photos on the orange peel texture finish walls of the foyer to give this space a personal touch. Share stories and lounge around with loved ones in the living room. Since this room is spacious, it can accommodate an L-shaped sofa, a center table, bookshelves, and you can even set up your home entertainment system here. Adjacent to the living room area is the open kitchen with 18×18 ceramic tile flooring, chic granite countertops, and birch cabinets for your all your storage needs. Enjoy a hearty breakfast with your family at the breakfast nook and have your kids’ packed lunches lined up atop the breakfast bar ready to go. Aside from enjoying a sumptuous meal with the family, the dining room is also great for enjoying a romantic dinner. Think flowers, elegant table settings, and of course a glass of wine to start the evening. This St. Andrews Park Villa also has a designated laundry area. Since it’s just steps away from the kitchen and all the other areas of the house, doing the laundry is definitely going to be convenient. No more going up and down a flight of stairs! There’s nothing like relaxing after a long productive day at work. Treat the master bedroom as your very own little piece of heaven. One of the most important features of any master bedroom is enough closet space. Fortunately, this home for sale comes with a walk-in closet for you to arrange all your clothes in. No more coats thrown over chairs, clothes all over the floor, plus shoes and bags messily piled on top of each other. If you’ve been having days and days of endless stress at work, sink into the roman-style bathtub and enjoy a nice warm bubble bath to relax and ease your worries away. The master bathroom also has a clear glass shower enclosure, a double vanity, and elegant chrome faucets. For guests staying the night, they can also enjoy the same decorator touches in the guest bathroom – ceramic bath accessories as well as a granite vanity with designer lights. The guest bathroom also has a bath tub. The St. Andrews Park Villas’ HOA fees cover basic homeowner’s insurance, community landscaping and irrigation, basic cable TV, internet access, street lighting, individual home lawn maintenance, maintenance of the homes’ exteriors, roof and exterior walls’ insurance, as well as full-access to the St. Andrews Park Community Clubhouse. The community clubhouse features a large swimming pool, a media room, a game room with a partial kitchen perfect for gatherings, and a complete fitness center. If sweating it out at the gym isn’t your thing, you can always take advantage of the swimming pool. The clubhouse has a large pool with sundeck, a covered patio perfect for lounging, and a heated spa. The community of St. Andrews Park Villas in Port St. Lucie FL boasts of 70 one-story villas with beautiful water views and lush preserve views. Close to unspoiled beaches, acres of nature preserves, and first-class golf courses, this is the perfect location to start living your dream life. Located on a premium lot with a beautiful view of the lush nature preserve, this home is actually one of the first homes that the developer will build in the community. Since this home is already under contract you can check out other available St. Andrews Park Villas for sale! Welcome to the lovely community of St. Andrews Park in Port St. Lucie FL located across The Champion Turf Club at St. James, 15 minutes away from the best beaches and deep sea fishing spots in the country! St. Andrews Park is a lovely community built by Tiffany Homes that is going to be made up of 70 beautiful and energy-efficient villas with water and preserve views. Boasting of the highest standard of new home quality construction, the price of the villas start in the low $200,000s. Among these is the villa that will be constructed on 6124 NW Wick Ln with 2 bedrooms, 2 bathrooms and a den offering living space at 1,710 square feet. With distinctive exterior appointments, this home features a concrete tile roof, a two car garage with an electric garage door opener as well as two remotes, brick pavers at the driveway and entrywalk, and designer coach lights! If you need more space, you can check out other St. Andrews Park Villas Model Homes and floor plans, too! Stepping inside this energy-efficient home, the first areas you will see are the kitchen and the great room. The entire living area features R-30 fiberglass ceiling insulation that will keep the home cool despite of humid temperatures outside, saving you on cooling costs. It also uses a Carrier ® heat pump heating and cooling system with minimum 16 SEER rating which will additionally save and put back around $2,000 into your pocket from operating costs within the system’s lifespan. This home also features impact resistant glass on it’s glass windows and sliding doors. One of the best things about St. Andrews Park Villas is that they offer plenty of customization options for you to choose from. Do you want built in shelves or maybe a different flooring for your den? Perhaps an entertainment center in your great room? With St. Andrews Park Villas, you can design the interiors of your dream home! If you’d like granite counter tops in your kitchen with a decorative edge and backsplash, there’s no need to upgrade because this is already part of the design of St. Andrews Park Villas. Included in the kitchen features are a breakfast bar, recessed panel birch cabinets and quality General Electric ® kitchen appliances, including a refrigerator with built-in ice maker, a smooth surface range, a built-in microwave, and a multi-cycle microwave in a choice of colors. The villa also has a beautiful little breakfast nook perfect to enjoy the day’s first heart-warming meal. The laundry area is just a few steps from the kitchen making doing day to day chores convenient and hassle-free. Natural light flows into your master bedroom. It also has a walk-in closet perfect to store all your daily wardrobe essentials, your sports wear, and summer wear. The master bathroom has a roman-style tub perfect for relaxing after a fun afternoon playing golf or socializing with neighbors and friends at the St. Andrews Park clubhouse. It also features designer lights over the double vanity area, elegant chrome Moen® faucets, and ceramic bath accessories. It has also has a clear glass shower enclosure in chrome. The guest bathroom features a bathtub and much like the master bathroom, it also has designer lights over the vanity area, a granite vanity top, as well as chrome Moen® faucets, and ceramic bath accessories. The St. Andrews Park Villas HOA fees cover basic homeowner’s insurance, community landscaping and irrigation, basic cable TV, internet access, street lighting, individual home lawn maintenance, maintenance of the homes’ exteriors, roof and exterior walls’ insurance, as well as full-access to the St. Andrews Park Community Clubhouse. The community clubhouse features a tropical swimming pool, a media room, a game room with a partial kitchen perfect for gatherings, and a complete fitness center. If sweating it out at the gym isn’t your thing, you can always take advantage of the tropical swimming pool. The clubhouse has a large pool with sundeck, a covered patio perfect for lounging, and a heated spa. Aside from being located minutes away from the best deep sea fishing spots, St. Andrews Park Villas are within walking distance to Publix shopping center! Golf enthusiasts will be pleased to know that St. James Golf Club and Country Club across St. Andrews Park offers both seasonal and annual memberships, too. There are also many beautiful nature preserves to visit that’s close to the area including the Oxbow EcoCenter’s 225 acre preserve. Find out more about the St. Andrews Park Community! This is the floor plan of this home. You can also view other available lots in St. Andrews Park to build your home on. Perhaps you’d like to live a few steps from the community’s tropical pool or have a home that backs up to a relaxing view of the canal. The gated community of St. Andrews Park Villas located in Port St. Lucie FL adjacent to The Championship Turf Club at St. James has begun construction on 20 new single story villas, with some scheduled to be completed by April 2016. As of this writing, buyers can still customize the interior finishes of their villas and select their appliances. Are you new to community of St. Andrews Park Villas built by Tiffany Homes? View the video below and find out what this beautiful haven in the heart of the Treasure Coast has to offer! Purchasing a brand new under construction villa in St. Andrews Park Villas is truly a great opportunity to customize your dream home in Port St. Lucie, avail of upgrades, and have the builder integrate them into your dream home before you move in. There are four available floor plans in St. Andrews Park Villas, each with upgrade and customization options. Here are the base prices of the different St. Andrews Park Villas floor plans excluding the upgrades and lot premium. Check this list along with the site plan which show the villas that are currently under construction in St. Andrews Park Villas. Would you like your home to be built on a lot with a relaxing waterfront view, or perhaps one with a view of the community’s luxury amenities? Reserve your dream lot today before someone else does! Call Nestor Gasset at 772-249-1061 or text “BuyVilla” to 561-623-957! Make your home buying experience a breeze by working with an experienced buyer’s agent who holds a solid track record backed by testimonials from satisfied clients! New Construction Home For Sale in Port. St Lucie FL! Build your dream home in St. Andrews Park and customize your interior finishes! Check out the photos of the model below for inspiration! For upgrades, additional charges may apply. Among these is the villa that will be constructed on 6116 NW Kendra Ln with 2 bedrooms, 2 bathrooms and a den offering living space at 1,710 square feet. With distinctive exterior appointments, this home features a concrete tile roof, a two car garage with an electric garage door opener as well as two remotes, brick pavers at the driveway and entrywalk, and designer coach lights! Aside from being located minutes away from the best deep sea fishing spots, St. Andrews Park Villas are within walking distance to Publix shopping center! Golf enthusiasts will be pleased to know that St. James Golf Club and Country Club across St. Andrews Park offers both seasonal and annual memberships, too. There are also many beautiful nature preserves to visit that’s close to the area including the Oxbow EcoCenter’s 225 acre preserve. Port St. Lucie New Home Construction For Sale! St. Andrews Park Villas in Port St. Lucie FL is a marvelous community that is going to be made up 70 beautiful single-story villas with water and preserve views. Located in the heart of Florida’s treasure coast, St. Andrews Park is the perfect place to enjoy the beautiful weather while experiencing the best luxury amenities. It’s relatively easy to find beautiful single-story homes in and around Florida but finding one that fits your budget – that’s got to be tough. Fortunately, this St. Andrew Park Villas home for sale combines comfort, convenience, and an upscale design without the expensive price tag. This is the Ashley model in St. Andrews Park Villas. It is a 3 bedroom 2 bath energy-efficient home with the total square footage of 2,635 sq ft, and 1,985 sq ft under air. Find out more about St. Andrews Park Villas floor plans and customization options! The energy-efficient and high-quality construction of this concrete block home can be seen all throughout – from R-30 fiberglass ceiling insulation, impact resistant glass for windows and sliding doors to the Carrier® heat pump heating and cooling system. As you step inside, you’re greeted by the neutral colored walls in the foyer, perfect for hanging artistic paintings, photographs, or other design elements you prefer. Going into the living room area, you’ll notice elegant high ceilings, the soft Mohawk® carpet, and latex flat finish interior painted walls. Turn this into a warm receiving area for neighbors and friends alike. The home has an open kitchen that boasts of ceramic tile flooring, granite countertops, recessed can lighting, and 42” upper birch cabinets with fully concealed hinges. The kitchen also features a walk in pantry. Create heartwarming homemade recipes in this state-of-the-art kitchen that comes with an array of quality kitchen appliances including a 25 cu ft. GE® side-by-side refrigerator with built-in ice maker and a built-in stainless steel GE® microwave which comes in your choice of color. You also have a GE® smooth surface range, a multi-cycle dishwasher, and the ½ H.P. In-Sink-Erator® garbage disposal unit. Enjoy your cooked meals at the breakfast bar or bring them over in the dining room and set up the table for an intimate dinner or a fun weekend lunch. Just a few steps away from the kitchen and dining room is the spacious family room where you can set up a modern home entertainment system and lounge around listening to music or watching your favorite shows. Turn the master bedroom into your private sanctuary where all worries is checked out at the door. Also, there’s no need to tidy up after clothes strewn across the floor or clearing a space on your bed because of the pile of clothes on it – since it has a walk-in closet! You’re sure to never lose scarves, shirts, and shoes ever again. We can’t promise any lost socks, though. The master bathroom is the perfect place for you to relax as it comes with a roman-style tub, clear glass shower enclosure in chrome, designer lights over granite vanity tops with undermount bowls, and chrome Moen® faucets. Guests will also feel at home with the same touches on the guest bathroom, including ceramic bath accessories, elongated comfort height toilets, and beautiful recessed panel birch cabinets. This St. Andrew Park Villas home for sale also comes with its own laundry room, accessible from the kitchen, making it even more convenient to do everyday household chores. If you feel like heading out for some fresh air, why not relax at the covered porch? While viewing the backyard, perhaps this would be a good space for you grow your very own mini herb garden or perhaps beautiful roses? You don’t even have to worry about lawn maintenance because it’s covered in St. Andrews Park Villas’ HOA fees, including basic homeowner’s insurance, community landscaping and irrigation, basic cable TV, internet access, street lighting, maintenance of the homes’ exteriors, roof and exterior walls’ insurance, as well as full-access to the St. Andrews Park Community Clubhouse. The clubhouse amenities include a complete fitness center, a grand gathering room for all your party space needs, a game room, and a large pool with sundeck. Speaking of amenities, you will surely love what St. Andrews has to offer! The community club house features a fitness center, a game room, and a large swimming pool! The clubhouse also has a grand gathering room that even has a partial kitchen perfect for get-togethers with neighbors and friends, and even celebrations. Spend a beautiful afternoon lounging around St. Andrews’ lagoon shaped swimming pool and heated spa. Perhaps enjoy a tall glass of iced tea at covered patio while enjoying the view of the lush community landscape. For amateur and professional golfers, across the street from the subdivision is The Champion Turf Club at St. James, a public course offering both seasonal and annual memberships. For those who love the outdoors, there’s the nearby Oxbow Eco-Center’s 225 acre preserve. Meanwhile, shopaholics will be delighted to know that the Publix shopping center is just a quick drive away! There’s really nothing more you can ask for in a dream home that fits your budget. New Port St. Lucie Home For Sale In A Gated Community! Disclaimer: Disclaimer: The model of this villa is “Durham”. The images below are of the model “Chelsea” and are used for illustration purposes only.